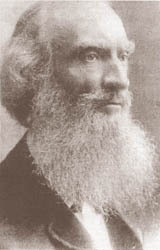 Sir Daniel Wilson (1816-1892) was a former president of the University of Toronto. He produced a book at the end of the 19th century that investigated the origins of the Native American peoples. He seems to have been convinced that there were frequent contacts between the Old World and the Americas, as far back as the time of the Phoenicians, and that these contacts brought news of America back to Europe, providing some of the basis for Plato’s description of Atlantis. His book can be read(a) or downloaded(b) online.